And the bigger, possibly more sobering picture is that even in non-drought years, Los Angeles averages only 15 inches of rainfall. So the problem of too little water for too many people is not going away. Ever. And it was a problem long before the governor hit the red alert button. But you know what? Other cultures have already figured this out, this business of crowding ourselves into hot, dry lands. And there’s great examples all around town. 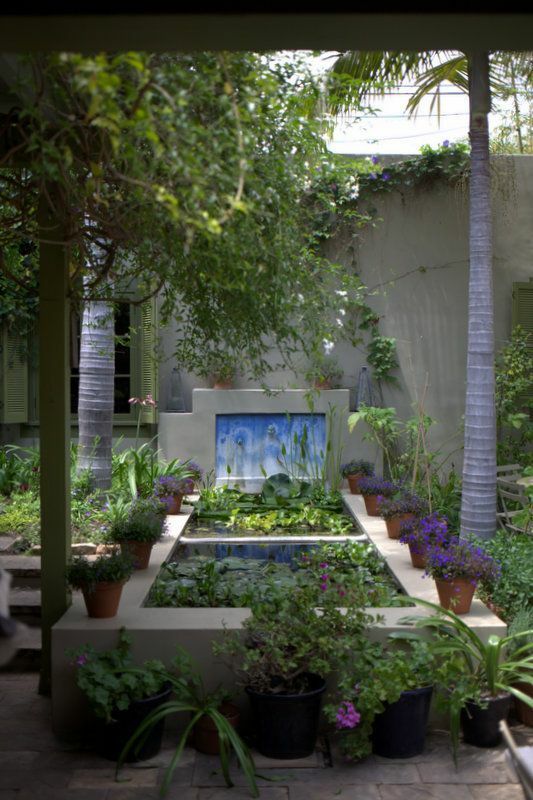 Landscape designer Nancy Goslee Power’s garden on the recent GC Open Days tour is a case study of these principles. And while we all obsess over what to do with the lawn, her almost 20-year-old garden suggests we might also think about where outdoors to eat, nap, cook, read, chat with friends, daydream, warm by a fire, take shelter from the sun, catch an ocean breeze, inhale clouds of jasmine — the scope of possibilities extends far beyond the boundaries of that poster child for this drought, the lawn, and what replaces it. 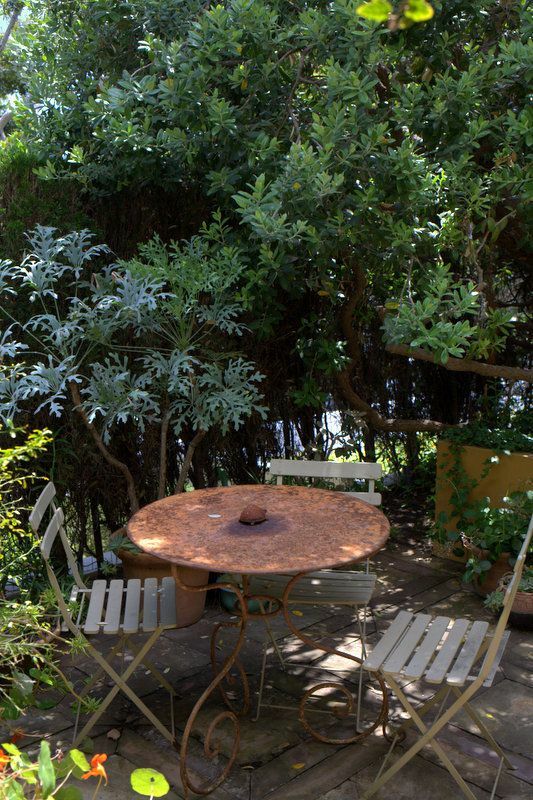 This little table and chairs is at the front of Ms. Power’s small Santa Monica house, just off the street, entirely screened by plantings. 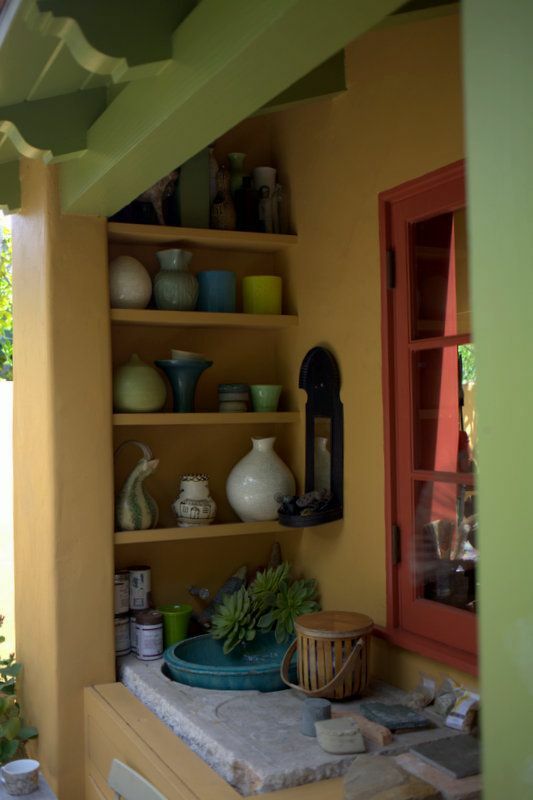 A short staircase zig-zags up from the sidewalk through retaining-wall beds filled with agaves and matilija poppies, depositing visitors in this shady “foyer.” A potted cussonia at the entrance to a garden is always an auspicious sign of good things to come. 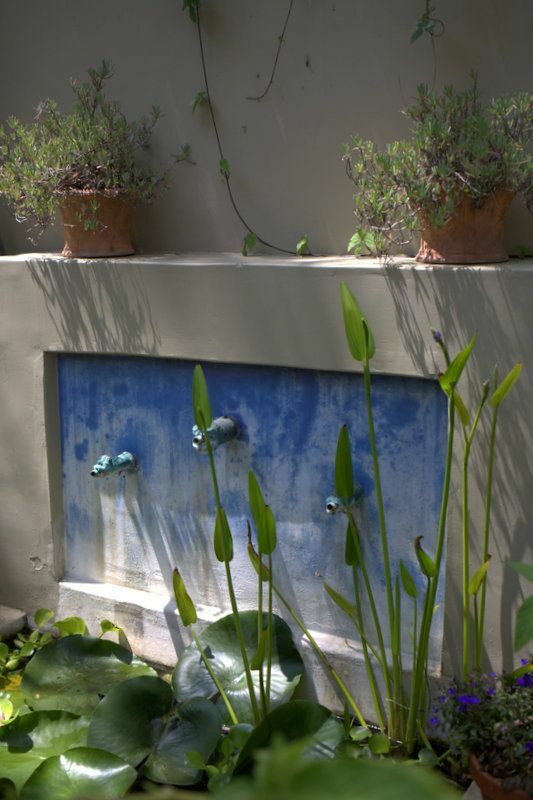 Also in the front courtyard is the first of many small fountains and pools. Implicit is the strong affirmative that, yes, water is precious stuff. Watch it glisten and sparkle in the sun, ripple in the wind, draw in birds. Just don’t ever take it for granted. 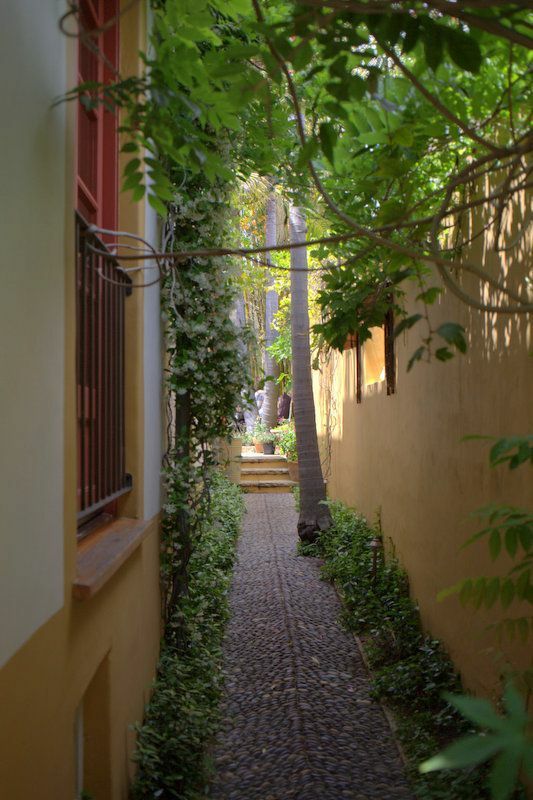 Narrow passage to the back of the house, a jasmine-scented journey this time of year. Already you can sense the strong interplay between indoors and outdoors, the feeling of shelter extending beyond the house, eager to envelope and claim the outdoors as well. Up those distant steps leads to the banquette in the photo below. The view from the kitchen door. 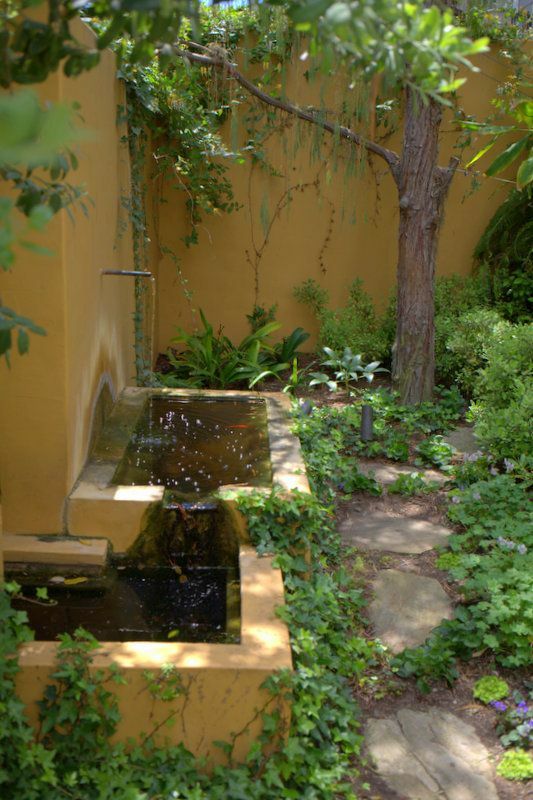 A small apartment/cottage shares the wall with the rill. Dining area off the kitchen, where the colors warm up. 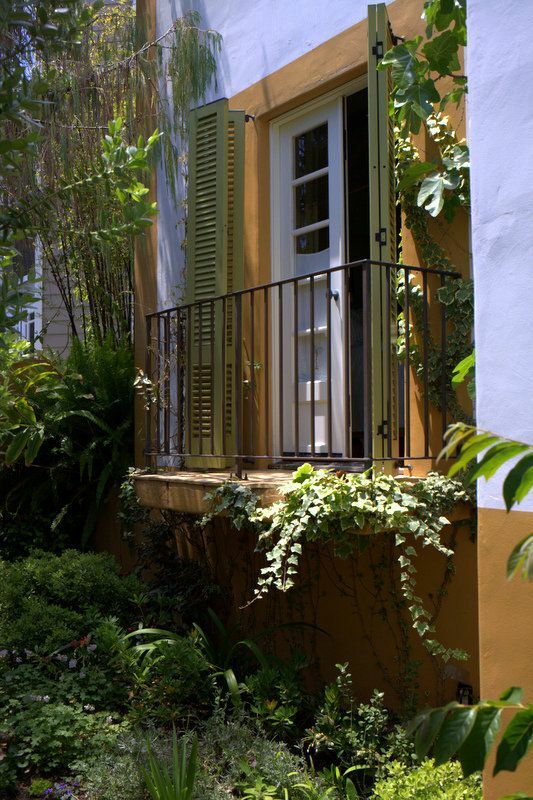 The kitchen, windows open to the narrow, pebbled side passageway, a nook in the wall for a potted plant just visible through the window. 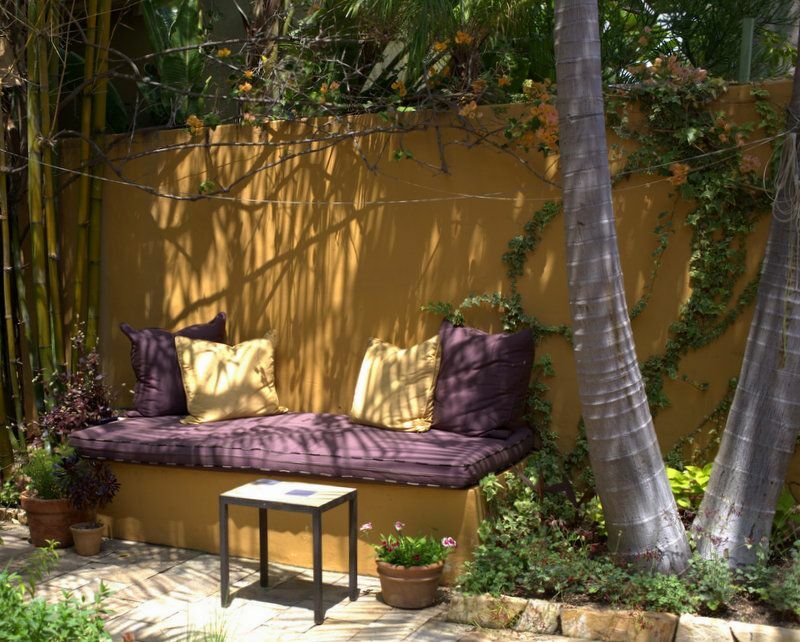 More shaded seating just off the kitchen. Everywhere were the tell-tale signs that the outdoors were as lived in as the indoors, if not more so. From the street, you’d have no idea what lay up that small flight of steps off the sidewalk, so tours like this are much appreciated. 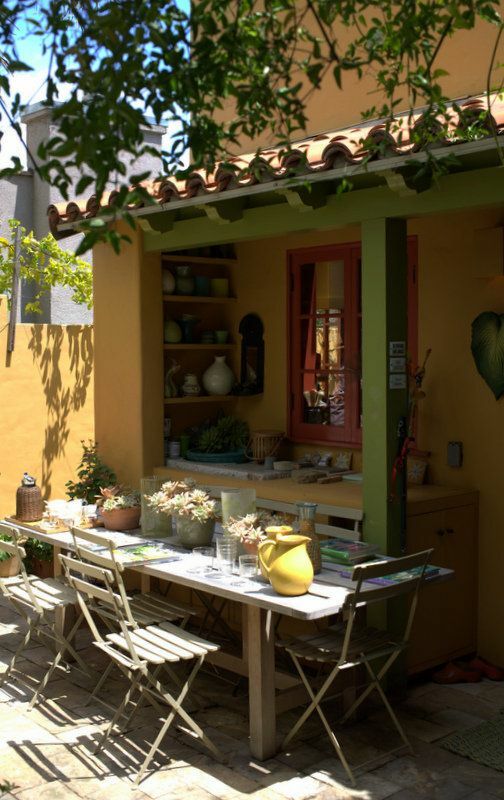 This entry was posted in climate, design, driveby gardens, garden travel, garden visit, pots and containers and tagged California drought, courtyards, Garden Conservancy Open Days Los Angeles, Nancy Goslee Power, Power of Gardens, walled gardens. Bookmark the permalink. Beautiful! So many good ideas. 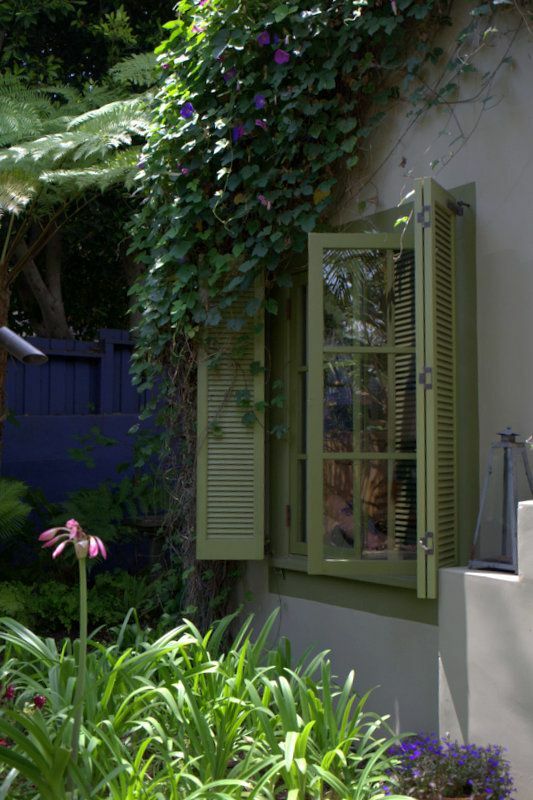 I especially like setting up the outside to be as lived in as the inside. I was so upset by the suspension of mandatory water conservation measures. It’s the same moronic mindset that gets politicians to spend unexpected windfalls in good fiscal years instead of putting money aside in a rainy day fund (pardon the pun). Fortunately, your photos of Nancy Power’s walled garden helped me calm down. What a serene space. It reminded me of southern Europe. Interesting to see how little changed this garden looks to be from when first installed and published photos. I can’t say the same for any of my gardens of the same age. I’ve always enjoyed her sense of style, the Norton Simon Museum gardens are my personal favorite of her work. 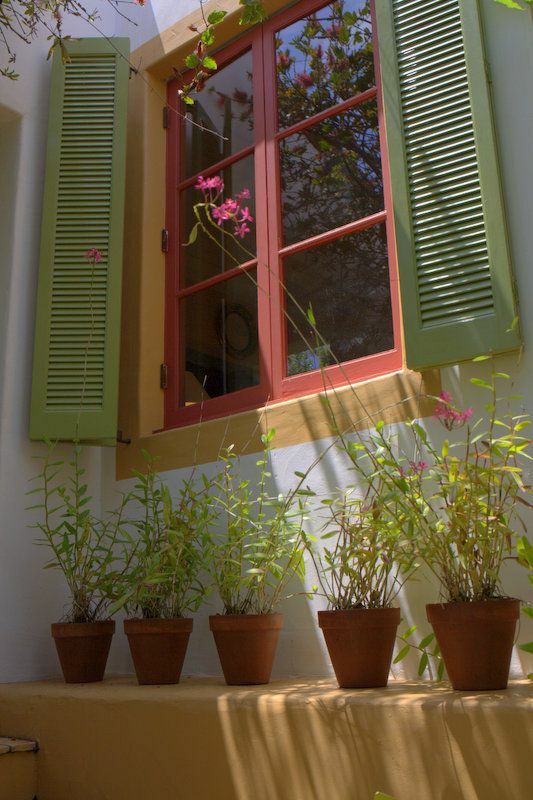 I love the color palette here, hard to pull off in a cookie-cutter tract house lot. I am still restricting my water use, though we had a much more normal rainfall winter here. I didn’t have to drag out the hose til this month,and will do a lot of targeted watering his year. I’m on board with Gerhard, some of the restrictions should be permanent. 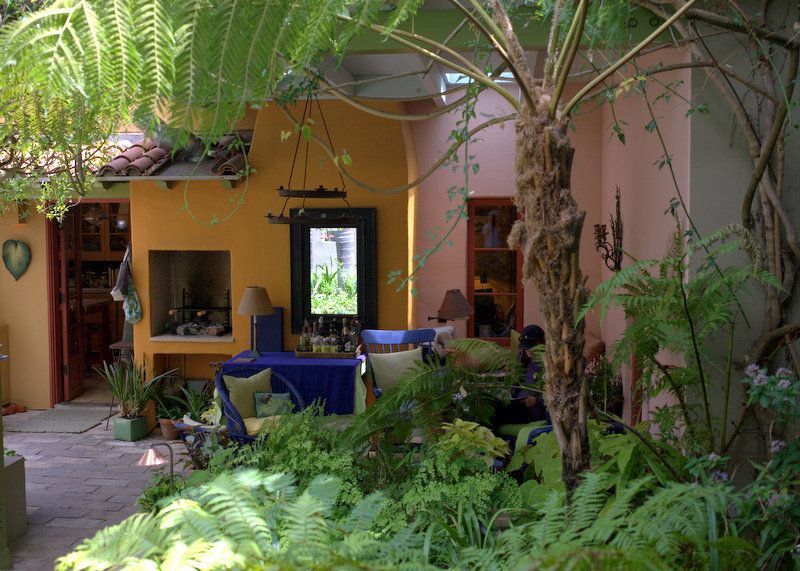 Thanks for sharing photos of your tour of Nancy Power’s garden! Like Gerhard, I’m concerned about the readiness to lift the restrictions when we’re still not up to pre-drought water levels. I suspect we’re going to be riding a roller-coaster of year-to-year adjustments, leading people to put off the permanent adjustments they should make given the constraints imposed by geography and climate. We’ve yet to see anything from our water board as to what this means to us locally but as I don’t think my area ever hit its 36% reduction target, hopefully some reasonable limits will remain in effect (beyond the obvious “don’t water the sidewalk” stuff). 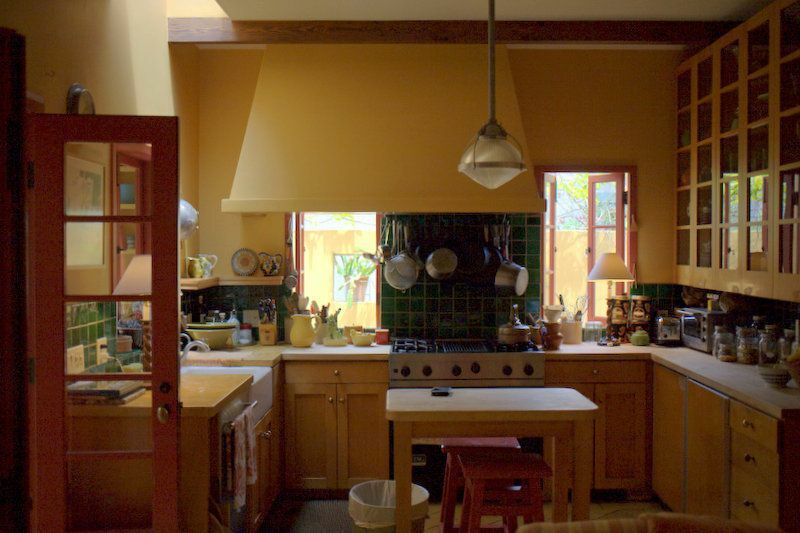 Lovely paint colors, sweet kitchen. The oversize of the vent in the kitchen–it also serves the outdoor grille? Huh, no, there’s a hole up above the grill with tiles removed. 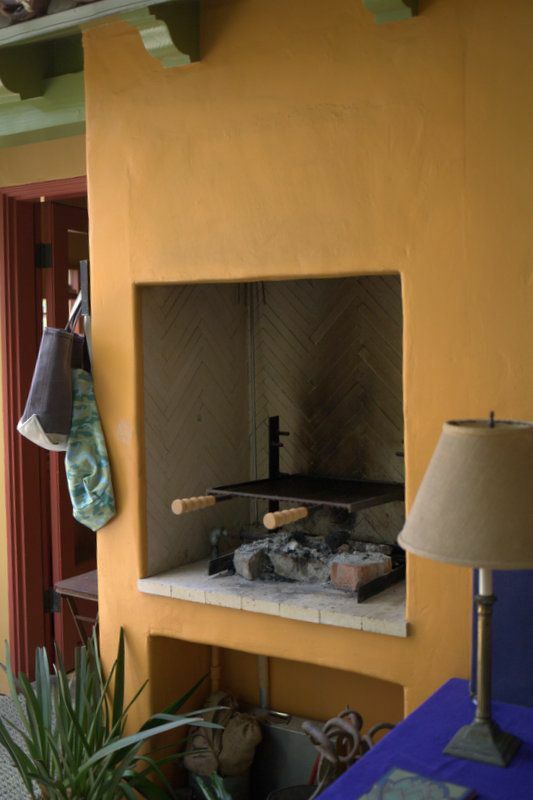 Looks almost like a fireplace was there originally, to the right, on the outside. 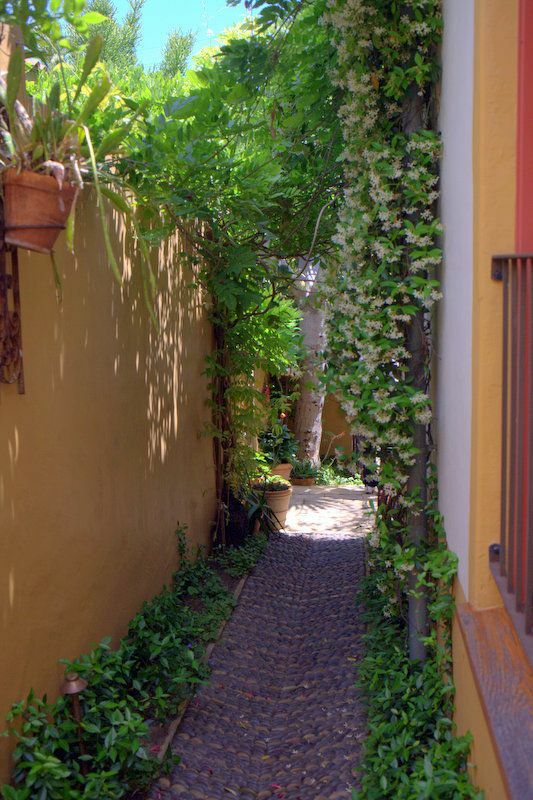 Also like the pebbled walk on the side yard. 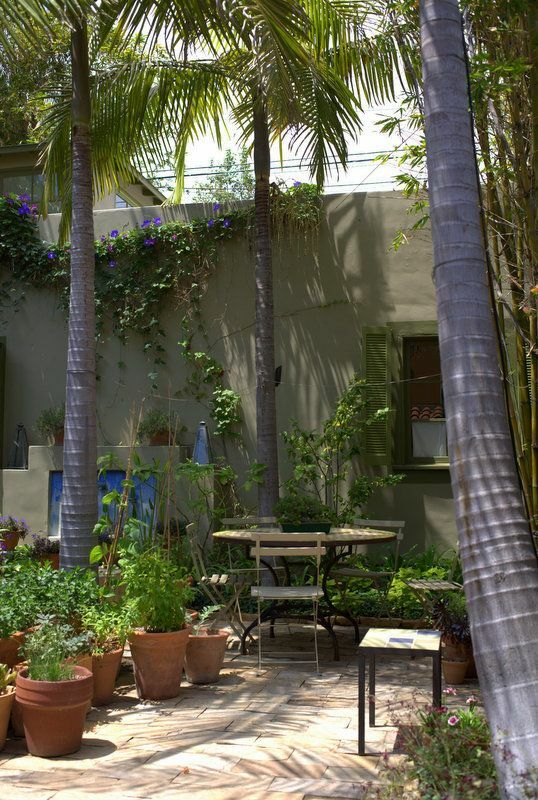 If I fit in with my neighborhood it would mean the holy trinity of here: raphiolepis, agapanthus, turf. I plan to continue my water conservation long term. I can see why Brown cancelled the program–agriculture is where the savings are, anyway, and the local water districts were screaming for revenue: “You want us to start laying people off in an election year, Governor Brown?” I think a good portion of the population will conserve anyway for monetary reasons–it saves money! I was surprised when I read the restrictions had been lifted (covered in our local paper no less!). But as hb mentioned it really is/was the agricultural uses that ate up most of the water usage anyway, right? Thank you for the beautiful, languid, photos I need a napatorium. I know right where it will go too, now I just need to convince Andrew.